Cut a piece of greaseproof paper slightly bigger than the bun tin, scrunch it up and cut into 12 squares. Place a square over each pastry and fill with baking beans (or dried lentils). This is a bit fiddly but it is worth it to have crisp pastry bases! 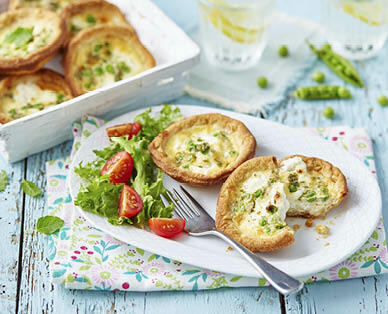 When the pastry has cooled, cut the goats' cheese into 1cm cubes and distribute evenly, along with the frozen peas, between the pastry cases.